My rating: 8.5/10. Great watch. Value for money, chunky watch. Hello, today I’m doing a Invicta 80074 review. I’m a massive fan of Invicta watches, I’ve been actively trying to feature more of them lately so here we go again with another one of their extremely popular models. 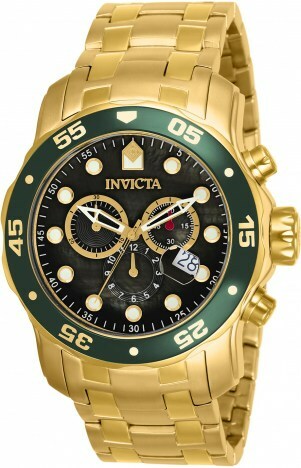 I hope you enjoy this Invicta 80074 review below. 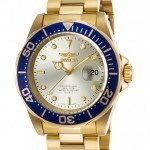 You may also like my related post: Are Invicta watches good? The design of this watch has a really luxury feel to it. The gold PVD plating on the casing and strap gives it an expensive look without breaking the bank. That green bezel looks exceptional as well, something I’m very pleased with. The dial itself features 3 chronograph sub-dials and a useful date display. There’s also a good amount of lume featured on the watch that I’ll look at in the ‘extra features section’. On the front of the watch, we have Invicta’s very impressive flame fusion crystal. There’s been a lot of discussion about flame fusion glass that can be found here. In terms of quality, it’s somewhere in-between mineral and sapphire glass. Overall though it’s pretty good for this style of watch in this price range. At the heart of the watch, we have a Japanese Quartz Hattori VD53 calibre watch movement. The Hattori company is actually part of the Seiko watch group so that’s quite reassuring to me. Quartz movements are reliable, accurate, and require very little in the way of maintenance. This is quite a chunky, oversized watch. The casing diameter measures 48mm and it has a thickness of 18mm. That thickness gives this watch a really prominent feel on your wrist, if you want your watch to get noticed, you’re going the right way about it. Obviously, due to the sheer size of this watch, it’s not ideal for people with smaller wrists. The strap is also made of stainless steel with this gold PVD coating. It’s fairly wide to fit in with the oversized casing design, the strap measures 26mm in width. The clasp is a standard style and easy to operate. There’s a couple of little extra features on the watch that some people may find useful. There’s a date display at the 4 o’clock position that has a magnifying bubble over the top of it for easier reading. Also, each of the hour indicators as well as the watch hands, features a generous use of lume for easier reading in dim lit conditions. The water resistance level of this watch is 200m. A rating of 200m / 20 Bar / 600ft makes this watch suitable for professional marine activity, serious surface water sports and skin diving. Band Stainless steel strap, standard length, 26mm width, standard style clasp. Dial Analogue display. The window lens is made of flame fusion glass. 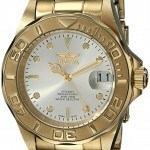 Invicta are well-known for their oversized stunning watches. 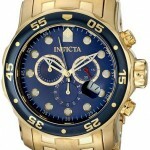 The Invicta 80074 is a very bold, durable looking watch. It’s still in that price range that I find acceptable for an Invicta watch so that’s good to see. Overall, I’d say it best suits someone who wants to get their watch noticed, and if that’s your aim, then this should definitely achieve this. Hope you enjoyed this Invicta 80074 review. Find more watch reviews below.